*Please note that the links to the content in this Part will direct you to Westlaw AU. The debate surrounding termination of strata schemes reveals the inherent tension between desirable redevelopment of urban land for the benefit of communities and society more broadly, and private property rights, which ought to be subject to the least amount of interference. In New South Wales, the current requirement of unanimity in order for a strata scheme to be terminated and the building sold, while affording the strongest protection for property rights, has been criticised for being unworkable in the face of intransigent minority owners. However, reducing the voting threshold to an agreement of 75% of lot owners in a strata scheme, as proposed by the Strata Schemes Development Bill 2015 (NSW), too readily sacrifices minority interests and creates undue uncertainty for strata-titled lot owners generally. The compulsory acquisition of (dissenting owners’) private property by private citizens, facilitated by removal of the unanimity requirement, is an alarming prospect, unprecedented in property law. To purchase this article, complete the Individual Article Sale order form and email it to tlranz.journal.orders@thomsonreuters.com. After the High Court’s decision in Sidhu v Van Dyke, Australian proprietary estoppel is no longer fettered by the minimum equity principle in deciding quantum of relief. This estoppel may offer monetary compensation reflecting market value in informal land contracts cases. Informal contracts are rendered unenforceable by the Statute of Frauds, meaning contractual damages are not available. In this regard post-Sidhu proprietary estoppel appears to be a blow to the Statute of Frauds. This article argues that the estoppel does not completely undermine the Statute of Frauds. That is because the estoppel does not compensate for loss of profits as contractual damages do. Contractual damages and equitable compensation are measured by two different sets of mechanisms and oriented by different criteria. The amount awarded by post-Sidhu proprietary estoppel may lie somewhere between pre-Sidhu proprietary estoppel and contractual damages. Although post-Sidhu proprietary estoppel has commercial significance, it is still not as good as contractual damages in monetary terms. In this regard, post-Sidhu proprietary estoppel may still be fettered by the minimum equity principle in a more hidden way. Australia, on a percentage basis, has one of the highest rates of pet ownership in the developed world. For most of us, we would, if asked, accept the legal position that our pet is our property and belongs to us. However, animals are of course sentient beings, and animal rights advocates are increasingly arguing for a legal status for animals distinct from that of being a piece of property. This note reviews two decisions from the Americas that came to diametrically opposed positions on this issue, and contrasts these against the approach taken in Australia. While change in Australia may evolve in ways different to other jurisdictions, in this writer’s view the influence of the non-property ownership paradigm for companion animals will bring change that is irresistible. This update on Singapore addresses two main developments. First, a far-reaching statutory amendment “clarifying” the depth to which surface landowners own subterranean space as well as associated legislation. Second, a court decision considering ownership rights of a Facebook page. 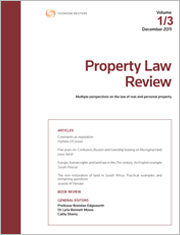 Servitudes, as they existed in Roman law, form part of South African property law. A distinction is made between praedial servitudes and personal servitudes (loosely, the English law equivalents of appurtenant easements and easements in gross). The extinguishment of a servitude by abandonment or agreement is discussed against the background of the recent case of Pickard v Stein 2015 (1) SA 439 (GJ). The court in effect distinguished between abandonment of a servitude by agreement and abandonment of a servitude without agreement. The court decided that by giving the owner of the servient tenement the right to build a brick boundary wall, the owner of the dominant tenement abandoned her servitudinal rights to light by agreement. Subsequent cancellation and permission for cancellation of the servitude by the mortgagee of the dominant tenement (as provided for in the Deeds Registries Act 47 of 1937 (ZA)) were not required as an additional requirement by the court for purposes of abandonment of servitude. It is argued that the Pickard decision is authority for the proposition that supervening lack of usefulness for which a servitude was created may constitute a ground for extinction of a praedial servitude. It is also submitted that a distinction should be drawn between extinguishment of a servitude by (a) abandonment as a unilateral act; and (b) agreement to either cancel or abandon a servitude. The recent decision of the New South Wales Court of Appeal in Registrar-General of New South Wales v Jea Holdings (Aust) Pty Ltd provides timely clarifying judicial insight into the required form and substance of easements under the Torrens system, preconditions to their valid creation and subsequent enforcement under the omitted easement exception to indefeasibility in the Real Property Act 1900 (NSW) when the easement is not registered against title to the servient tenement. The case draws on and extends a line of reasonably recent superior court decisions dealing with these issues, putting it now beyond doubt that, in New South Wales at least, a Torrens easement is validly created even if registered against title to the dominant tenement alone. This then allows the easement to be characterised as having been omitted from the folio of the Register of the servient tenement to enliven the statutory exception and to burden its registered proprietor despite having purchased bona fide, for value and without notice. This is a surprising outcome in a regime where the Register is everything and one which those dealing with Torrens land should be well and truly aware. Email is rapidly replacing other forms of communication as the preferred means of communication between contracting parties. The recent decision of Stellard Pty Ltd v North Queensland Fuel Pty Ltd  QSC 119 reinforces the judicial acceptance of email as an effective means of creating a binding agreement and the willingness to adopt a liberal concept of “signing” in an electronic environment. As Australia’s population grows, government authorities will need to compulsorily acquire more land for further infrastructure development. It is important that lawyers advising clients whose land is compulsorily acquired understand the intricacies of the process. A Queensland Supreme Court case has looked at whether a tenant had a compensable right after the survey plan in which it held a leasehold interest was amalgamated with the adjacent survey plan. A strip of land was acquired after the survey plans were amalgamated. Prior to the amalgamation, the tenant would not have had a right to compensation. The Supreme Court found that the tenant did have such a right, upholding the appeal. It is a good example of how the compulsory acquisition process is not as straightforward as it often appears. The case also has wider implications for property lawyers generally, particularly those who regularly draft leases which must be consistent with the Retail Shop Leases Act 1994 (Qld). Commonwealth Bank of Australia v Psevdos  SASC 66 involved the effect of a caveat in the context of a priority dispute between two equitable mortgages. The decision did nothing to subvert three well-known principles of the Torrens system of title by registration: (i) that registration, and nothing else, creates a legal proprietary interest in land under that system; (ii) that the Torrens system does nothing to the operation of equity and equitable interests in land that arise by any means which would have been possible had the Torrens system not existed; and (iii) that a Torrens system caveat adds nothing to the existence of equitable interests created in Torrens system land. Still, while confirming these principles, the decision offered no further clarification of the respective ambit of the time and equality components of Rice v Rice in respect of a priority dispute between two competing equitable interests. For the pdf version of the table of contents, click here: Prop L Rev Vol 5 No 1 Contents.